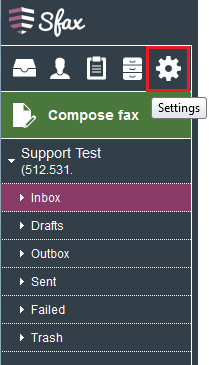 To enable or disable email notifications you will need to first login to your Sfax user account. Once you are logged in you will need to select the Settings option. After selecting the Settings option you will be taken to the User settings for "My Profile". You will need to scroll down on the page to the "Account Notifications" and "Email Notifications" section. Here you will see your username listed and the three email notifications that can be enabled for your account. Place a check mark in the fields that you would like notifications enabled for and select "Save". If you are unable to make changes to your email notifications contact the local administrator of the account as they may have this option disabled. If you are the only user on the account and unable to make changes please submit a request to support@sfax.j2.com for assistance.